Please call owner Scott at 859-803-2106. Boat is in Cincinnati, Ohio. 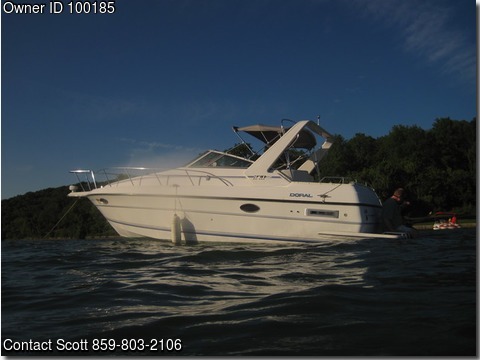 1992 Doral Prestancia 270MC 27' cabin cruiser actual length 29'6", 9'6" beam Twin v6 engines 175 hp each combined 350hp Volvo-Penta outdrives Dual counter-rotating stainless steel props, zinc anodes, Bottom Paint, Sleeps 6, aft cabin with full size bed and privacy curtains. Stereo with cd player. 30 amp ship to shore power. Cabin Headroom 6'2" Stand up shower, full head, kitchen, microwave, stove, hot water heater, transom shower, above deck sink Sun Deck Pad. Radar Arch, Trim Tabs, Anchor, 3 Batteries, Large swim deck with ladder, Cockpit cover, Bimini top, full camper top enclosure. Boat is currently winterized and shrinkwrapped in storage. Storage paid thru April 2016.